While champion Brock Lesnar has never been one to pull any punches – although Shane Carwin is hoping he will Saturday night when they collide at UFC 116 for the undisputed heavyweight crown – the brash wrestler wasn’t interested in kicking a downed Fedor Emelianenko. “It was disappointing. 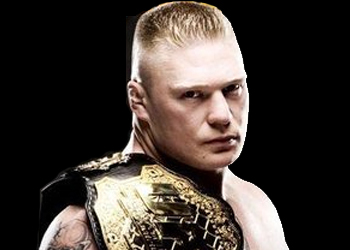 I hate to see a guy like that,” Lesnar told The Jim Rome Show of Fedor’s abrupt fall from grace. “Whether his legacy was more of a mystique than it was, he stood up and he was respectful and it was tough to see. It reminded me of my first fight against Frank [Mir] when I got really anxious and fell right into the trap. When asked if it was possible to sympathize with the man most consider the planet’s top 265-pounder – despite his uncanny ability to dodge, duck, dip, dive and dodge the Octagon – the former WWE superstar claimed to be spearheading the “2-4-6-8-Who-Do-We-Appreciate” charge. “I feel bad for him,” Lesnar candidly stated. Although Lesnar witnessed Fabricio Werdum end Emelianenko’s nearly decade-long winning streak in :69 OH MY GOD seconds, he believes his legacy is still intact because it happens to the best of them – including Lesnar. Emelianenko’s resume still reads an unprecedented 31-2. He rattled-off 27 straight W’s the last time he lost a scrap.